So to start the evening right... we had some appetizers, to cool us off first we had Conjonudos-fried quail eggs with pimiento and serrano ham in baguette(left) and the white garlic and almond cold soup -with grains of almonds (P70). I love appetizers, but in this case I'll have to say pass on the Conjonudos, if in case you don't know, eggs and me don't really mix, much so much quail eggs. "The Club" knows why I don't really like eggs but that is a long story, but my friends say it was a break from the ordinary appetizers they have had for quite some time. Moving on, this was the first time I was ever trying a cold soup, so how to take this soup, first you dipped in the grape on the side and so I took a sip then straight to go just like a shot of tequila, the taste was on unfamiliar territory, as it gave many a flavor to my taste buds. But more of it tasted like the garlic sauce served in shawarma kiosks but made into a soup on a lighter note that is, as I love garlic sauce and I always smother it on my shawarma, this was all I can say is it gave a whole new meaning of soup for me. More appetizers and a drink to satisfy our thirstiness, the Camembert and caramelized onions on flueted bread - left (P180) - I love this so much!!! It was tasty, sweet and delicious, the caramelized onions won me over. What you can do is just to order more to satisfy your cravings. And to cool or warm things up, depends on you...a find glass of Sangria. Spanish cuisine without the traditional chorizo? No way, another Tapella’s certified favourite, the Chorizo in red wine (P245), it may look spicy but its not and the taste of chorizo... classic! Just the way I liked it! The Calamari el bulli (P255), another fancy starter will painstakingly make anyone forget the old-style impression with Spanish food. Made from the squid’s black ink stains, the soft mollusk is covered into a batter resulting to a crispy and tasty dark finished, served with aioli dip and fennel leaves. Don't be fooled by how it looks, fried to a crisp it is one of the best tasting calamari dish I have ever had in my life. No exaggeration. period. Octopus with Paprika, salt and virgin olive oil (P280), a hefty serving I may say good for a group of 3 and my oh my, never thought octopus when in the right hands could taste so good. You just know when its fresh, crisp and flavorful to the last bite, a definite must try. Tapella incorporates a modern and alluring twist to paella with its Manchego cheese, chicken, and shrimp paella (P500). Don’t wonder why Tapella’s contemporary version of this most-loved paella is a major hit. The robust rice, meat, and seafood fillings are made special by the pleasing taste of manchego (Spanish cheese made from ewe’s milk), perfectly melted on top of the hefty serving that can satisfy up to 3 persons per order. Top it off with a wide selection of desserts surely to satisfy the sweet tooth in you. "Tapella has provided good, honest and simple food that has kept guests coming back," said Executive Chef- Alexandra Cacho. "The latest evolution of our menu combines craveable favourites and provide guests the freedom of choice with sweet and savory selections to meet their cravings no matter the time of day." Tapella is open daily from 11am until 12mn. Wine all-you-can paired with tapas and canapé’s is served every Friday from 6 to 9 pm. Dinning at Tapella comes with complimentary WIFI — a premium amenity among Gaudi Restaurants. Located at Ground Level of cosmopolitan Greenbelt 5, Tapella is surrounded by top Bussiness Offices, eight theatres and high end shops, making it the ideal spot for a quiet coffee, a fashionable business lunch or a romantic dinner. 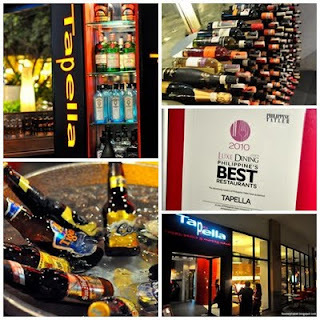 TAPELLA offers a wide variety of Spanish cuisine served in an informal and relaxed ambience. Headed by Executive Chef Alexandra Cacho, the restaurant specializes in tapas and paellas plus a wider range of salads, pastas and desserts served the Spanish way that will surely perk up the gustatory spree. The wine selection is from around the world valued well for money. The ambiance gives a modern and relaxed atmosphere with interiors designed with plush of red and beige accent. For more information or reservations, call 7572710 and 7572711.